The number of people with lung cancer is increasing every year, so to identify the symptoms of lung cancer is conducive to its treatment. 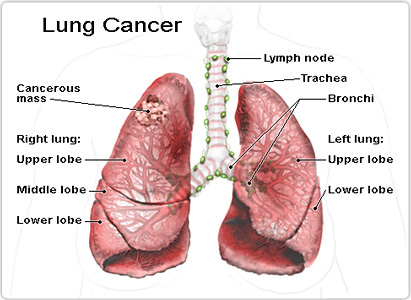 Currently, lung cancer is one of the most common primary malignant tumors of lung, which mostly originates in bronchial epithelium, so lung cancer can also be called bronchial lung cancer. 1. Cough: there are about two thirds of patients have cough, which is the most common symptom of early lung cancer. It can be manifested as mild dry cough, severe cough, cough with high frequency or cough at night. Experts from Modern Cancer Hospital Guangzhou remind: once these suspected symptoms of lung cancer are found, you should go to regular hospital for further check and treatment.